Captain Jack, is that your girl friend? 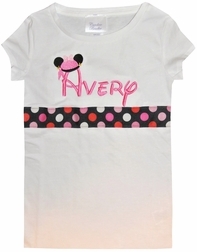 Here we take a white cotton shirt and monogram it with your little girl's name in hot pink Disney font. 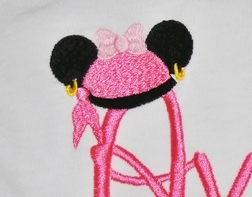 On top of the first letter, we embroider a Minnie Mouse ears hat dressed as a pirate. The hat is decorated with a hot pink head scarf and gold earings in her eats. She also has cute pink bow on top of the hat. 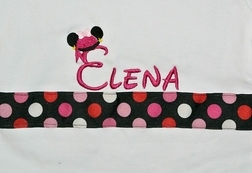 Under the monogram we embellish the shirt with black ribbon pink and white dots.